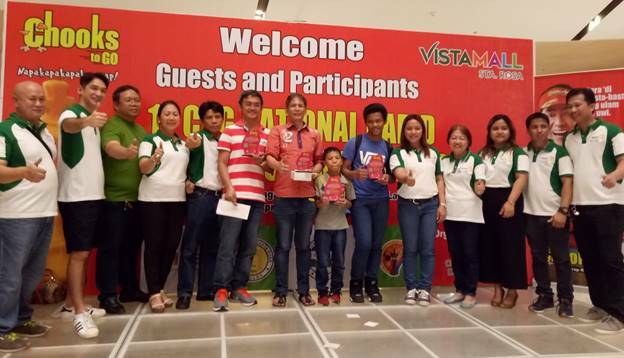 Over 300 chess players vied for honors in the 1st Chooks-to-Go National Rapid Chess Championship held last April 29 in Vista Mall, Sta. Rosa in Laguna. The tournament had three categories—Open Category for 19 y/o and up, Junior Category for 13 – 18 y/o, and Kiddie Category for 12 y/o and below. Winners for the Open Category are Grand Master Darwin Laylo, who was hailed as champion; International Master Barlo Nadera, 2nd place; and Grand Master Rogelio Antonio, Jr. placed third. For the Junior Division, the following successfully outwit their peers: Mark James Marcellana (Champion), Istraelito Rilloraza (2nd place), and Ruther Barredo (3rd place). Kiddie events were also on tap. Chester Neil Reyes emerged as champion, trailed by Robert James Perez and Jeremy Marticio, for 2nd and 3rd place, respectively. The winners took home cash prizes and trophies. 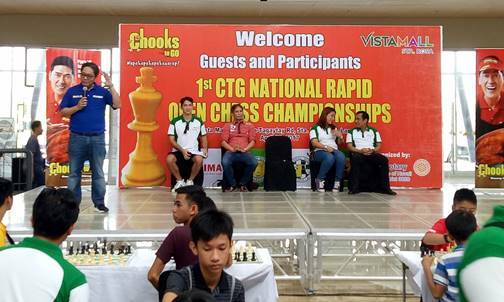 The 1st Chooks-to-Go National Chess Rapid Championship was organized by Rotary Club of Nuvali and was sanctioned by National Chess Federation of the Philippines. It was organized by Laguna Chess Association head Dr. Alfredo Paez, NA Alexander Dinoy, NA Ireneo Gonzales, CAN Catalino Mendiogrin, and CA Joel de Guzman. The event aimed to develop good thinkers through the understanding of chess strategies and tactics, improving the logical abilities and rational thinking and reasoning of the participants, and instilling a sense of self-confidence, self-worth and camaraderie. Further, the tournament is also a fund raising activity to help the Rotary Club of Nuvali in its charitable activities.